Enterprise Social Networking: Business Case, Adoption, & Engagement – co-developed and presented with Carrie Basham-Young, Principal, Talk Social To Me. Designed for executive sponsors of social initiatives, community managers, and technical leaders of social product portfolio. Flexible & Agile Workstyles & Processes for the 21st Century Organization co-developed and presented with Susan Scrupski, Founder, Change Agents Worldwide Joachim Stroh, Change Agent, Change Agents Worldwide, Carrie Young, Principal, Talk Social to Me. Half-day workshop designed to shares 21st century network practices of Change Agents Worldwide – how they work, their values, how they adopt/adapt/ exapt new ways of working with their global team and new processes based on agile and self-organizing principles. Columbia University Adjunct Faculty –Information and Knowledge Strategy Masters’ program, School of Professsional Studies. co-teach two courses since 2014. 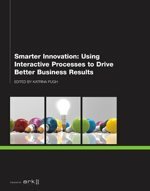 Smarter Innovation: Using Interactive Processes to Drive Better Business Results Smarter Innovation authors teach us how effective innovation interactions are more collaborative and iterative — bringing the agility so essential for living with industry disruption.